Click on image for more pictures, cities with Catholic Evangelism, Stories, and What YOU Can Do! 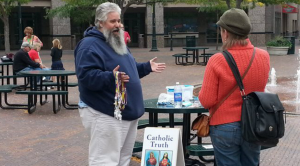 Cities across the country are now set up with Catholics evangelizing in the streets. And the phenomenon is growing. Many are converts, some have been Catholics all their lives – but all are excited and can’t keep it quiet any longer. They are training new recruits. It is fun and fruitful. It is blessed and earns rewards in heaven. It is saving souls. Please check out their website, join if you can, help as you are able. These are people using their own funds and time. Can you help them? I am sending a check for $250 to help them with much needed signs. Contact them with ways you can help. Hear Steve Dawson explain on Relevant Radio here. As Ross Hoffman would say, “Whaaaaaaaaaaaaaaaaaaaaaaahooooooooooooooooooooo!! !” I love SPSE!!! I am the internet chapter of SPSE, if you will. I work on videos and audio, and put them up on Youtube. Recently, I sent some audio to Steve Dawson, so he could send it to Deacon Herold Burke Sivers for a radio program he is doing. I believe it’s called, “Question(s) from the Street”. It’s question(s) asked from ordinary people on the street who stop, and have question(s) concerning the Faith, and Deacon, will answer those question(s) from his program. SPSE has converts, reverts, and cradle Catholics who are indeed on fire… I am one of them, and proud of it! For those who read this article, along with this comment, and want a short, personal convert story, from me… You can go to the “Conversion” section of of this webpage: http://www.catholic-convert.com, and scroll down to where it says, “Sandra Reads Herself into the Catholic Church.” It’s a condensed story of my journey, and some of the most profound things that played a part in my journey, are not mentioned. But readers, fellow converts and even reverts, can probably relate, and have gone through a similar journey. God Bless SPSE, and God Bless Steve Ray and his family! And God Bless everyone! Everyone, please spread the word! If you are in the Springfield, IL area…come join us! The Lord be with you and the noble work you do. Spirit of the Lord that breathes life into His Church inspire you and satisfy your noble longings and desires. Even in Bus’s in the Philippines we are Doing the evangelization, they are astonished to know that we, Catholics are doing it. In entering a Bus, we also pay our fare. As Choir member also of our Parish, We sang to evangelize our Mass goers. But in doing these, we first evangelize our families to be effective evangelizers. To God be the Glory, forever. Amen. It is time for Catholics to hit the Streets to Evangelize and Catechize about the Catholic Truth. Jesus sent the 72 two by two to spread his teachings. It is a pre-cursor of his commissioning the apostles and disciples commanding them directly “to teach, to baptize and spread the Gospel to all nations to the ends of the earth and to the end of time”. Join Street Evangelization and form teams in your parishes to pass on what Jesus taught that the Apostles and their successors has strongly and faithfully safeguarded this past over 2000 years! Follow the link for supporot and information. I’ve been in christian church for 26 years and now im home in the catholic church for almost 5 years..Great job!!! I appreciate you guys! Keep it up n i love it..there’s nothing like the catholic faith…God bless You all..